"Charity Covereth A Multitude of Sins"
 Christ therefore having suffered in the flesh, be you also armed with the same thought: for he that hath suffered in the flesh, hath ceased from sins:  That now he may live the rest of his time in the flesh, not after the desires of men, but according to the will of God. For the time past is sufficient to have fulfilled the will of the Gentiles, for them who have walked in riotousness, lusts, excess of wine, revellings, banquetings, and unlawful worshipping of idols. Wherein they think it strange, that you run not with them into the same confusion of riotousness, speaking evil of you. Who shall render account to him, who is ready to judge the living and the dead. Saint Vincent de Paul, the founder of the Congregation of the Mission and of the Daughters of Charity, was not a mystic. He was given no special private revelations from Heaven during his arduous labors in serving the poor as he would have served Our Blessed Lord and Saviour Jesus Christ in the very Flesh. No suffering was too great for him to bear to serve the poor, whose presence he, chosen against his will to be a councillor at the court after the King Louis XIII of France, whose confession he heard before his death on May 14, 1643, preferred to all others on the face of the earth. It was one of the most severe penances of Saint Vincent de Paul's life filled with penances and mortifications and sufferings, including cruel service in slavery in what is now Tunis, Tunisia, in 1605 for a period of two years just five years after his ordination to the priesthood in 1600. Indeed, Saint Vincent de Paul had to match wits with the detestable Machiavellian, Jules Cardinal Mazarin, while serving as a councillor to the court of King Louis XIV during the time that his mother, Queen Anne of Austria, served as his regent until the child-king was old enough to govern between the years 1643 and 1651. Saint Vincent de Paul, thought nothing, however, of walking into the king's court in his old cassock, caring only that his garment was clean and had not been torn. WHEN Louis XIII was on his deathbed, with all the Bishops and Archbishops of France ready to offer him their services, it was M. Vincent, the humble Mission Priest, who prepared him to meet his God. During the last days of the King's life, Vincent never left him, and in his arms Louis XIII breathed his last. Then, having done the work for which he had come, Vincent slipped quietly out of the palace to hasten back to St. Lazare and his beloved poor. Some remarks made by the King during his illness and certain other words of Vincent's were remembered by the Queen, Anne of Austria, who had been left Regent during the minority of her son. Richelieu was dead, and Mazarin, his pupil, a crafty and unscrupulous Italian, had succeeded him as chief Minister of State. His influence over the Queen was growing daily, but it was not yet strong enough to override all her scruples. She was a good-natured woman, quite ready to do right when it was not too inconvenient, and it was clear to her that of late years bishoprics and abbeys had been too often given to most unworthy persons. In France the Crown was almost supreme in such matters; the Queen therefore determined to appoint a "Council of Conscience" consisting of five members, whose business it would be to help her with advice as to ecclesiastical preferment. Mazarin's astonishment and disgust when he heard that Vincent de Paul had been appointed one of the number were as great as Vincent's own consternation. The responsibility and the difficulties which he would have to face filled the humble Mission Priest with the desire to escape such an honor at any price; he even applied to the Queen in person to beg her to reconsider her decision. But Anne was obdurate, and Vincent was forced to yield. "I have never been more worthy of compassion or in greater need of prayers than now," he wrote to one of his friends, and his forebodings were not without cause. If Mazarin had been unable to prevent the Queen from naming Vincent as one of the Council of Conscience, he had at least succeeded in securing his own nomination. In the cause of honesty and justice, and for the Church's welfare, the Superior of St. Lazare would have to contend with the foremost statesman of the day, a Minister who had built up his reputation by trading on the vices of men who were less cunning than he. Well did Vincent know that he was no match for such a diplomatist; but having once realized that the duty must be undertaken, he determined that there should be no flinching. He went to Court in the old cassock in which he went about his daily work, and which was probably the only one he had. "You are not going to the palace in that cassock?" cried one of the Mission Priests in consternation. "Why not?" replied Vincent quietly; "it is neither stained nor torn." The answer was noteworthy, for a scrupulous cleanliness was characteristic of the man. As he passed through the long galleries of the Louvre he caught sight of his homely face and figure in one of the great mirrors that lined the walls. "A nice clodhopper you are!" he said amiably to his own reflection, and passed on, smiling. Among the magnificently attired courtiers his shabby appearance created not a little merriment. "Admire the beautiful sash in which M. Vincent comes to Court," said Mazarin one day to the Queen, laying hold of the coarse woolen braid that did duty with poor country priests for the handsome silken sash worn by the prelates who frequented the palace. Vincent only smiled—these were not the things that abashed him; he made no change in his attire. "Monsieur Vincent," as our saint was called, cared not for human respect, explaining on many occasions that he was devoted to serving the poor as he would serve Our Lord Himself, expecting nothing other than contempt and ingratitude from those he assisted. That's right, Saint Vincent de Paul did expect, nor did he want, "thanks" for his efforts. He was merely discharging his duty, cognizant that the human condition is such that many recipients of generosity are not going to be grateful for his service to them. He was also quite grateful that he was mocked and reviled by those who considered themselves to be of "high station" in this world. He knew that the day of reckoning would come for all, that each person would have to make an account of his life at the moment of his Particular Judgment, that it was a great gift from Our Lord Himself to be able to suffer all manner of calumny for trying to be like unto Him no matter the lack of his "reputation" in the midst of the world. These quotations serve brutal reminders to those who prowl around the internet seeking who has "said what" about them to thank God if some injustice has been done to them by another. Who cares if someone misunderstands us? Who cares if someone has spoken ill of us? Who cares if our true faults and failings and misdeeds are revealed to many before they are known to all men at the General Judgment of the living and the dead on the Last Day? Isn't it good to suffer humiliation in this life as one seeks to make reparation for his sins and those of the whole world by offering up to God through the Sorrowful and Immaculate Heart of Mary whatever merit they earn for "earning their stripes" as soldiers in the Army of Christ? Is any one of us exempt from suffering as a result of our sins? Is any one of us exempt from suffering to save the souls of others? Why be so concerned about "protecting" one's "reputation," especially when so few people are even aware than any of us exists? Our disordered self-love is such that we exaggerate our "importance" in the scheme of things, thinking that so many people are looking at what we say and what we do even though the reality is that we are nobodies who are invisible to all but a handful of people. St. Vincent de Paul, too, was utterly opposed to worldly policy, and in his dealings with others was most careful to avoid all evasions and artifices. The very shadow of falsehood affrighted him, and he had a horror of equivocations, which deceive an inquirer by answers of double meaning. Saint Vincent de Paul, apart from serving the poor without regard to what anyone, including the poor themselves, thought about him, was firm defender of the Holy Faith. He was almost solely responsible for the establishment of the seminary system in France that had been mandated by the Council of Trent in the Sixteenth Century. Only ten of the twenty seminaries that had been established in France at the end of the century in which Saint Vincent de Paul was born were still in existence in France by 1625. It was at the invitation of the bishops of France that Saint Vincent de Paul started giving ten day conferences/retreats to men who were to be ordained to the priesthood, gradually increasing the numbers of days into months and, finally, years, transforming what had been a haphazard, informal method of training men into the system that worked so very well under the infiltration of Modernism at the end of the Nineteenth and the beginning of the Twentieth Centuries. Saint Vincent de Paul was directing eleven seminaries at the time of his death at the age of eighty years on September 27, 1660. Saint Vincent de Paul's zeal for educating future priests extended also to conducting yearly retreats for priests that were extended eventually to members of the laity. Over eight hundred people attended these retreats each year between 1633 and 1660. It is estimated that 20,000 people attended these retreats over the course of those twenty-seven years. His Congregation of Priests for the Mission, known today as the Congregation of the Mission, established universities in addition to seminaries, and although Saint John's University in Jamaica, Queens, was in the grip of the conciliar revolution when I studied there between February of 1970 and December of 1972 (completing the four year program in three years by taking summer session courses, something that prepared me to teach such courses just a few years later), there were a lot of older Vincentians on the campus who gave exemplary witness to Catholic truth, including several I knew from my ten years of on and off adjunct teaching (being paid per course) there between 1982 and 1992. I owe those priests quite a lot. It is so sad to see the spirit of Jansenism thrive today, not only in the counterfeit church of conciliarism, replete with is "liturgical reform" that is perfectly in accord with the Jansenist principles of the illegal Council of Pistoia that were condemned by Pope Pius VI in Auctorem Fidei, August 28, 1794, a condemnation cited by Pope Pius XII in Mediator Dei, November 20, 1947, but in fully traditional chapels where people are denied the Sacraments arbitrarily even though they defect from nothing contained in the Deposit of Faith and must sometimes live in fear of being expelled because of this or that dispute. Such a spirit of fear is that of Jansenism. The Sacraments are not weapons to be used to browbeat the faithful into accepting positions that have not been defined by Holy Mother Church or as a means to "punish" those who are critical of institutionalized abuses against souls. Saint Vincent de Paul fought against such a spirit. How sad to see its recrudescence both within the counterfeit church of conciliarism and in so many of our fully traditional venues. We are firmly convinced that the truths of faith cannot deceive us, and yet we cannot bring ourselves to trust to them; nay, we are far more ready to trust in human reasonings and the deceitful appearance of the world. This, then, is the cause of our slight progress in virtue, and our small success in what concerns the glory of God. And why are you still so interested in the blatherings of naturalists of the false opposite of the "right" who think that a return to "constitutional" principles will "save" our country when those very principles are premised upon the ability of man to "resolve" social problems and maintain a good social order without submitting to the Deposit of Faith in all that pertains to the good of souls and without a belief in, access to and reliance upon Sanctifying Grace? Nations founded on false, naturalistic premises (and Protestantism is NOT Christianity; it is hideous in the sight of God as it is a rejection and corruption of the truths contained in the Sacred Deposit of Faith) are bound to degenerate more and more over the course of time, something that will be explored once again in the article to be posted tomorrow, Friday, July 22, 2011, the Feast of Saint Mary Magdalen. Recognizing that the work of his priests for the education of the clergy and the laity and in their service to the poor needed to be assisted by the prayers and charitable works of consecrated religious, Saint Vincent de Paul founded the Daughters of Charity, an institute that was so favored by the Mother of God at the dawning of the Age of Mary in 1830 as she appeared to Sister Catherine Laboure in the convent at Rue de Bac, giving us her Miraculous Medal of Grace through her (see In Ways That Baffle the Minds of "Modern" Men and In Ways That Baffle the Minds of "Modern" Men, part two), as she gave the Green Scapular to Sister Justine Bisqueyburo ten years later, that is, in 1840, knowing full well that we would need these sacramental aids as the wellsprings of Sanctifying and Actual Graces would dry up as a consequence of the very Jansenist-inspired liturgical "reforms" of conciliarism. This was Our Lady's way of ratifying the good work of Saint Vincent de Paul, who was so hated by the French revolutionaries that they sought to preserve his relics from the same fate of destruction that was visited those of Saint Louis IX, King of France. Following many translations, his bones, which are encased in a wax figure, now rest in a magnificent reliquary in the chapel of the headquarters of the Vincentian Fathers, Rue de Sevres, in Paris. The head of the representation is said to be a true likeness of the Saint. His still incorrupt heart, however, is enclosed in a golden reliquary which is exposed on the altar of his shrine in the chapel of the motherhouse of the Sisters of Charity, 140 rue de Bac, Paris. A short distance from this relic there is enshrined beneath a side altar the perfectly preserved body of his spiritual daughter, St. Catherine Laboure, the visionary of the Miraculous Medal. Also in this chapel on a side alter can be seen the the reliquary which contains the wax figure of St. Louise de Marillac, the co-foundress of the Sisters of Charity. The bones of the Saint are contained in the model. 1590–Child Vincent prays to Mary. 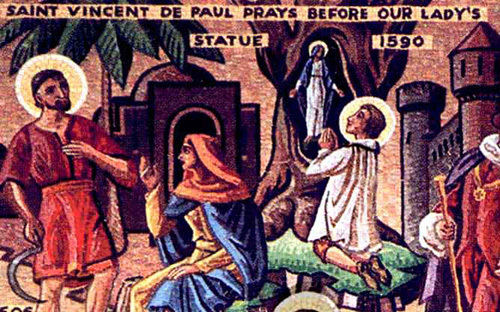 In Vincent de Paul's youth there was no known shrine to our Blessed Mother in the region of Puy, neither at Buglose nor in a tree as pictured here. Nevertheless, he had for Mary a tender, filial devotion and wished that this devotion be one of the most sacred traditions of his sons and daughters. May each of whatever good works we perform as the instruments of Our Lady's graces in this passing, mortal vale of tears be rooted in the same filial devotion to Our Lady as Saint Vincent de Paul, a bridge, if you will, between the work of Saint Francis de Sales and Saint Louis Grignion de Montfort. May Saint Vincent de Paul help us to treat others as we would treat Our Lord and His Most Blessed Mother, counting it as our gain to die to self and to suffer for others to be more united with our Redeemer and our Co-Redemptrix, thanking God at all times for the occasions on which we are humiliated for doing good and calumniated for speaking the truth. We must remember that our sins deserve far, far worse than anything we can suffer in this life. May it be the mercy of God upon our souls to help us to want to suffer more humiliation and misunderstanding so that we can plant a few seeds for the restoration of the Social Reign of Christ the King that was nearing its end in France by the time of the death of Saint Vincent de Paul.